We’d love your help. Let us know what’s wrong with this preview of Forgive No More by Seb Kirby. 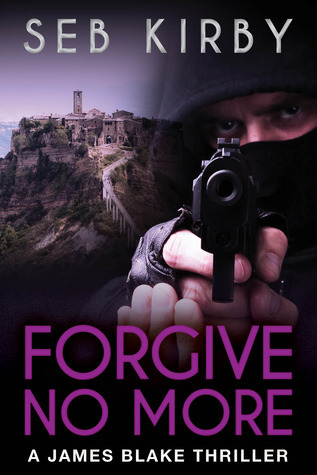 To ask other readers questions about Forgive No More, please sign up. "A Captivating Story of Corruption and Conspiracy"
This is an awesome novel Author Seb Kirby has intelligently written which takes you to many crimes of deception. The first part of the story describes the players and actions of the first two novels. Don't let this encumber you, it all comes together quickly with the same villains and those hunting the criminals. In this final novel of the James Blake Series, James, his wife Julia, and newborn son, Simon, are tucked away in the English Lake Distr "A Captivating Story of Corruption and Conspiracy"
This is an awesome novel Author Seb Kirby has intelligently written which takes you to many crimes of deception. The first part of the story describes the players and actions of the first two novels. Don't let this encumber you, it all comes together quickly with the same villains and those hunting the criminals. In this final novel of the James Blake Series, James, his wife Julia, and newborn son, Simon, are tucked away in the English Lake District, only safe for a short time. There are still those in the world who want to find James and his wife ending their lives forever. One agent, Franks, has already been tracked down and killed, and James believes high level Agent Nate Craven had ordered the killings. Craven runs black ops within the Federal Bureau of Investigation and is making millions providing safety of drug cartel shipments from the cartels in Mexico into the United States as well as Europe. He is also seeking the end of James and his wife. The Lando family, now run by the son, also is hunting James with a two million dollar reward. Wolfgang Heller, an assassin, works for the Lando's but has taken time off to ponder a few things as to why he may have chosen to kill over 100 people, but spared one little girl. He's holed up at the Sera Monastery, in Lhasa, Tibet. He has sought meditation and perhaps forgiveness as he is now devout with the rank of Ajahn, a teacher. But, is it still revenge he wants, or the million dollars? Heller had been the person who planted bombs at Town Lake which killed a politician and most of his family, but Craven covers the facts by saying the bombs were provided by extremists in Africa. James has to find evidence to bring all this corruption and criminal activity to an end. He chooses to leave Julia safe in the farmhouse of a close friend high in the hills over the Ambleside Valley in England. While James heads into the danger zones to find evidence as to the Lando's involvement, his brother Miles, an investigative journalist, is also working to the same end in the U.S. and in Mexico. This thriller is non-stop, high action, and conspiracy events will take you to England, Italy, Germany, Mexico, and also Texas, where the Town Lake bombing took place. There are many true facts included in this exciting story which take one back to the activities of the Nazi's during World War II, secret organizations formed world wide based on mythology, as well as the theft of valuable artwork stolen during World War II and now may be found. Once you get into this story, you will stay with it to the end. The story is compelling, extraordinary, and finely honed. But it will all come to an end you will least expect, so stay with this story for the exhilarating ride. This, the third in this compelling series of “NO MORE” James Blake books, is a riveting read. I loved it, not least because it finally provides answers to so many unresolved questions, conspiracies and dark secrets that have desperately affected James Blake and his family over the previous two books, and which sent him, his wife Julia and newborn child into hiding in the Lake District under assumed names. Thus, anyone who has read and enjoyed the two earlier action-packed thrillers will, I know, This, the third in this compelling series of “NO MORE” James Blake books, is a riveting read. I loved it, not least because it finally provides answers to so many unresolved questions, conspiracies and dark secrets that have desperately affected James Blake and his family over the previous two books, and which sent him, his wife Julia and newborn child into hiding in the Lake District under assumed names. Thus, anyone who has read and enjoyed the two earlier action-packed thrillers will, I know, find this one equally gripping. Owing to the many colourful characters in all these books, many of which are included again in this latest one, I did initially find myself slightly confused when a familiar name cropped up, that rang a bell from the earlier books, but I couldn’t altogether place their significance. There are many intriguing, international characters mentioned in this book, including deceased FBI Agent Jack Franks and corrupt agent Nate Craven, various members of the despicable Lando family, now run by the son, Matteo, UK Inspector Hendricks and of course the evil assassin, Wolfgang Heller, just to mention just a few, who have all appeared within the James Blake storylines. However, once I eventually had them and their correct importance to the trilogy clearer in my mind, this novel soon revealed itself to be yet another masterfully written page-turner. The author’s unique writing style of short chapters and tight sentences keeps one constantly on the edge as the story gradually unfolds. As I expected, the complex storyline is full of stimulating twists and turns. It touches on so many criminal things such as drug smuggling cartels and art theft as well as some fascinating early Nazi history, involving again some quite horrific situations for James to deal with. Set mostly in London, and Italy, it also takes us with James’s investigative journalist brother, Miles, to Germany and Mexico with some equally evocatively described locations, involving yet more excitement and enthralling non-stop action. All of which culminates in reaching a seriously gripping and hugely satisfying ending. Seb Kirby fans will not be disappointed. I award it 5 stars. This is the third and probably final book in Seb Kirby's 'No More' trilogy. Protagonist James Blake and his wife, Julia (plus their tiny baby) are separated while James, goes to Italy and Germany. As in the 2 previous books, James is hot on the trail of the nefarious Lando family and their heinous crimes. The story is far reaching and covers art, mythology, drugs, FBI black ops and towards the end, Blake learns about an ancient sect within the Nazi party. Seb Kirby has many ‘balls in the air’ with this story, and towards the mid to end of the book the excitement and tension builds. The reader has to pay close attention to detail, location and the many characters; otherwise vital clues will be lost. But Seb does touch on the first two novels to refresh the readers’ memory to help things along and everything comes nicely together. This novel of Seb’s is very good – a thriller in every sense, with plenty of action and tension spread throughout. Once you’ve read a couple of chapters there’s no doubt you’ll want to know what comes next. A page turner in every sense of the word and an exhilarating ride! This is the final book in Seb Kirby's 'No More' trilogy and it's as internationally wide-ranging and exciting as the previous two. James and Julia Blake and their three week old baby are separated while James, in Italy and Germany and his brother Miles in South America, follow the Lando family's fortunes. This is a huge story arc touching on drugs, art and mythology. Seb Kirby manages to keep the excitement cranked up in so many locations and on so many levels. Because of the scope of this book, This is the final book in Seb Kirby's 'No More' trilogy and it's as internationally wide-ranging and exciting as the previous two. James and Julia Blake and their three week old baby are separated while James, in Italy and Germany and his brother Miles in South America, follow the Lando family's fortunes. This is a huge story arc touching on drugs, art and mythology. Seb Kirby manages to keep the excitement cranked up in so many locations and on so many levels. Because of the scope of this book, the only problem I had was remembering who was who though that could well be down to my age. If you love a good thriller with plenty of action and intrigue, this is the series for you. As the third book in the series, there was a lot of background to fill in at the beginning, but once the story got going, it soon picked up pace and was a cracking read! All together an excellent trilogy.